Four Season Design provides realistic images of new landscapes, as well as detailed plan drawings. 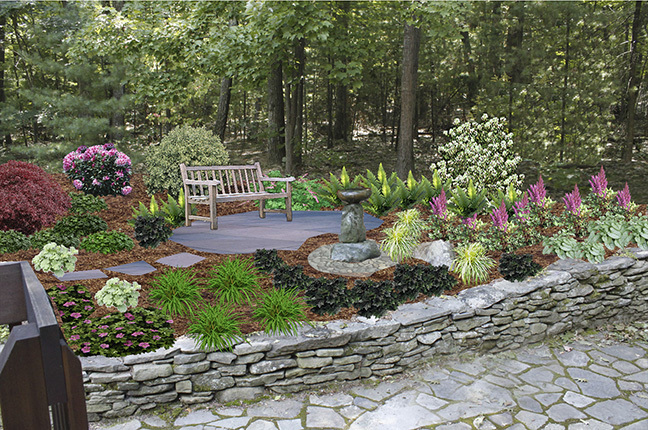 Conceptual image of a woodland sitting area. As a professional landscape designer I have been providing comprehensive landscape architectural plans for clients for over 30 years. New software allows overlays of design concepts on photos of existing landscapes. The result is a realistic picture of the new landscape design. Clients can visualize the design with ease, and have a better understanding of the overall concept. The image can be altered as it is discussed, allowing quick turnaround time from concept to final master plan.